Find a little piece of coastal history to treasure as a souvenir with a visit to the extensive and always fascinating Poor Charlie's Antiques and Flea Market. Located in the midst of the historic district of New Bern, this eclectic shop has a treasure trove of goods and wares to entice any collector, history buff, or everyday shopper. 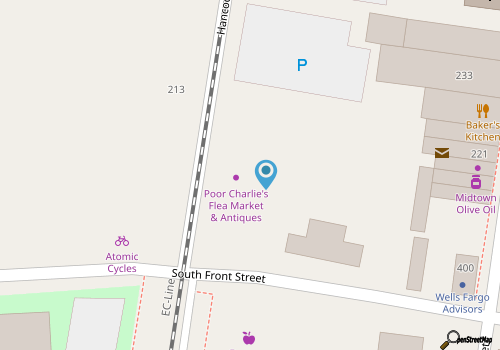 Poor Charlie's Antiques and Flea Market is situated just off of Hancock Street, and is easy to reach for visitors strolling through the many shops and landmarks of historic Downtown New Bern. The interior of the shop features a wide array of goodies and gems, thanks to 17 distinct booths that sell an array of antiques and collectables. While goods may change on a daily basis, shoppers can expect to encounter heirloom jewelry, glassware, furniture, books, household items, gifts, and an array of other vintage and nostalgic items all housed within a striking and historic original warehouse. Always filled with surprises, and fascinating to newcomers and regular patrons alike, Poor Charlie's Antiques and Flea Market is a must-see destination for anyone who loves a little vintage shopping, likes to explore the treasures of the past, and / or is just looking for a unique shopping experience. Call 252-672-0208 for current hours.